Orange Juice is a variation of Green Fresh, in many colors and with several variations. The default variation is for blogs and works on all screen widths from 1024 pixels and up. It's iPhone compatible and fixed to 950px wide so that your layouts are predictable. The wide variation is ideal when you need all the screen space you can get for your project. It grabs 90% of the screen width, up to 1200 pixels wide. You say: if you want to use this theme, just link your CSS to this theme. Yeah, sorry about that! I needed a clean set of theme names and better now than later. It looks like this theme is only 800 pixels wide. How can I make it wider? 1020 +? Please read the page, there is a section titled "Wide variation". You can also customize the theme very easily by copying/pasting the code for the wide variation and setting your own width. 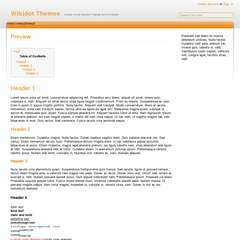 Please read this blog posting about customizing your theme. Does anyone have the css of this theme in case it gets deleted? The CSS is in the page, feel free to copy and reuse. It will not be deleted. What does this link contain then? This page contains three code blocks, one for the normal theme, one for the example of the CSS to use, and the third one for the wide variation. Each time you modify your CSS, you have to update your page with the collapsible block of CSS code that is actually used by the theme. In fact the theme pages for the rainbow and minimalist themes are generated automatically, so all I need to do is copy/paste. This lets me maintain other aspects correctly, such as the navigation links to all the themes in the set. Say I want to add a wide variation to the minimalist theme set: I regenerate, and copy/paste the new pages. It would be even easier with the API when that is working. But yes, in many cases it would be better to have a static inclusion. I've edited your weneed:97 because it was suggesting a solution but not explaining the problem. See if it's better now. Did you have a look at the Google Analytics new layout ? It reminds me of something… but what? 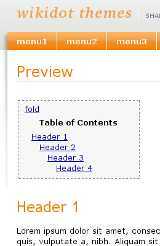 I was using http://themes.wdfiles.com/local--code/orange-juice/3 and even this http://themes.wdfiles.com/local--code/orange-juice/ theme seems to not be working correctly…was there some changes made? Does anyone else have this issue? I've also had some problems on Wikidot today but they're gone now and it's like Rob says, due to server migrations. All working now. No they're not, I've not got any of my affected sites back yet and I have a deadline of the end of the day tomorrow for one of them so fingers crossed…..